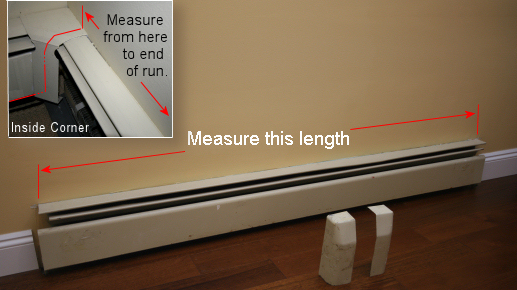 Configurations involving an "L" or a "C" layout should, as illustrated below, always subtract the depth of the adjacent heater cover (always 3") from the actual length measured. For L SHAPE COVERS be sure to measure the length of back plate from the end near the wall, to the other end of the back plate, furthest way from the corner, that is your length. Or measure from the corner, to the end of the back plate, furthest away from the corner and subtract 3 inches, that is your length. ( example 75″ – 3″ = 72″ ). This needs to be done for both left and right sides. Your end caps are calculated into all length measurements.